As we have discussed solutions for improving the open floor plan office and accounting for diversity within the environment, we have looked at integration and elasticity that tension fabric architecture provides. Last in our series, we will be discussing the acoustical benefits that are offered through the use of textiles. One of the biggest challenges within the open office environment is sound; Sound from voices, sound from printers, sound from walking, tapping, whistling and just about anything you can imagine that makes a noise. Sound is distracting, and noise has been repeatedly linked to reduced cognitive performance. It inhibits our focus, and productivity lies hand in hand with focus. When focus is hindered, productivity can decrease by 66%. This is BAD! While fabric architecture can offer privacy in its design, the natural quality of textiles aid in combatting sound. The level of acoustical performance a textile offers is dependent on variables such as density and pile. Because of their loose, soft and porous attributes, textiles are considered porous sound-absorbing materials. Layering fabric with air space acts as an enhancer for cutting acoustics so stretching fabric over a frame structure is a secondary benefit. 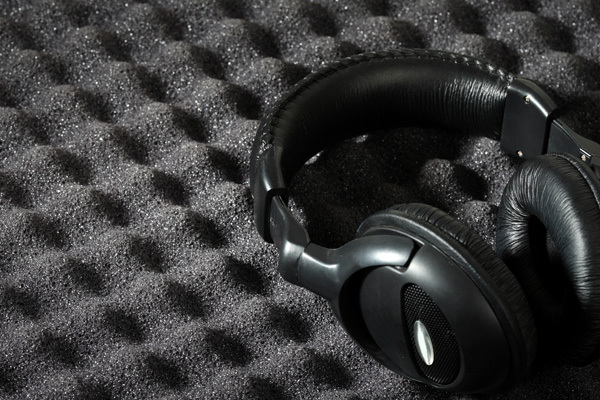 For large environments, or spaces that require added acoustical privacy, sound deadening materials such as felt board can be integrated into the structure, behind the fabric. This significantly reduces Reverberation Time (RT60) and improves speech clarity. With the natural aversion many of us have to noise, any extra absorption helps.